The next several weeks are crucial in Canada's housing market. Ottawa's Let's Talk Housing initiative wrapped up consultations in late October, and is now working toward tabling the results on Nov. 22. But for anyone expecting a full-on housing policy on that date -- best not hold your breath. The next several weeks are crucial in Canada's housing market. No, it has nothing to do with the fall sales period, or any lull expected from the oncoming holiday season. It's all about policy -- seeing the real impact, over a longer period, of the latest round of changes to mortgage regulations -- and what is to come from the federal government's recent efforts to begin building a National Housing Strategy. Ottawa's Let's Talk Housing initiative (#LetsTalkHousing in social media vernacular) wrapped up consultations in late October, and is now working toward tabling the results on Nov. 22. For anyone expecting a full-on housing policy on that date -- best not hold your breath. After consulting provincial bodies, industry experts and others -- including everyday Canadians -- Minister of Families, Children and Social Development Jean-Yves Duclos now faces a daunting task: to come up with a national strategy that addresses the multiple and varied issues, and executes a vision that is equitable across differing economies, markets and conditions. From affordable housing to rental markets to home ownership, the issues are complex and far-reaching. Affordability is sure to be a key item in the strategy, given skyrocketing prices in Vancouver and Toronto and concerns about future home ownership ability of Canadians. The issue is a particular challenge for low-income families and those in remote communities. Canadians are not shy about their views on this issue. "The average detached home in Toronto is $1 million, and prices have been increasing by about 19 per cent," Toronto resident Melissa Illes-Brooks wrote on the public consultation tool on the Let's Talk Housing website. "How does that compare to income? The median family income in Toronto is $75,000, meaning an average home costs 13 times that amount. Certainly, most people's wages don't increase by 19 per cent per year. I worry that when my son grows up, the average home in Toronto will be $2 million and home ownership will only be a privilege for the wealthy. We are heading in that direction and need to act now." Lack of affordable rental housing -- and removal of that limited supply to make more condos -- is another burning issue. "The ever increasing 'conversion' of apartments to condos is a huge detriment to affordable housing," Shane Nestruck wrote on letstalkhousing.ca. "In my area, older apartments are continually being converted into condos with exorbitant up-front costs to the young, and impossible costs for lower income and senior populations." There are also serious quality concerns with these building conversions, he says. And on the oft-publicized topic of investment, particularly foreign investment, there are countless calls for speculation taxes to curb market over-activity. Experts hope that the consultative process of Let's Talk Housing yields solutions that make more sense than unilateral policy changes such as the latest round of mortgage rule changes. Those regulations were intended to reduce housing activity, slow home price growth and mortgage indebtedness, but they are also making it more difficult for first-time buyers to get into home ownership. Indeed, this latest round of rule changes reduce one risk but create another, says Canadian housing market economist Will Dunning. Subsequent effects could include a severe reduction in housing market activity and negative effects in the broader economy. "The government is aiming to reduce the risk of a housing market implosion. The new policy is based on a future event that is possible, but has a low probability of occurring -- that in five years, mortgage interest rates could be more than two points higher than they are today," says Dunning. "In so doing, it is creating a risk that is also possible, and seems to have a higher probability of occurring -- that its policy could have severe negative effects for the housing market and the broader economy. It would be useful to have more public discussion on the trade-off of risks." And doesn't this all foreshadow the challenge of developing a national housing strategy, when in fact a national housing market doesn't exist: how to devise a policy that is fair and equitable across a country as vast as Canada, with regional economies and wildly varying real estate market? 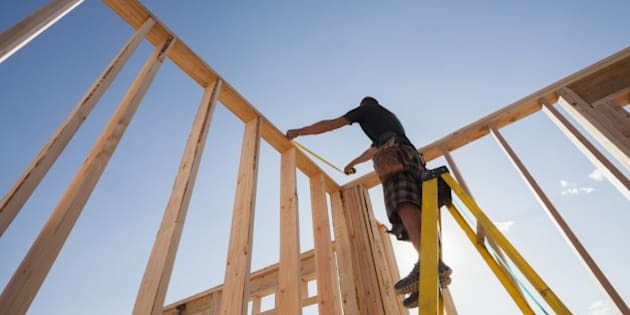 The Canadian Home Builders' Association (CHBA), for one, made a formal submission to the National Housing Strategy consultation process. The brief, Toward a Comprehensive, Sustainable National Housing Strategy, includes a wide range of recommendations for improving housing access and affordability for all Canadians. "To succeed, we will need extensive collaboration between governments, (non-governmental organizations) and the private sector, and new and innovative approaches," says Kevin Lee, CHBA CEO. The CHBA report lays out a range of recommendations that focus on the full "housing continuum" -- for improving the effectiveness of social housing initiatives, boosting the supply of new market-based rental housing, and improving housing affordability for the middle-class and those working hard to join it. "It is important that the National Housing Strategy cover the full spectrum of housing from social housing through to affordability in market-based housing. With homes in our largest and most economically vibrant cities now often beyond the financial reach of middle-class Canadians, not addressing affordability in the broadest sense will simply result in increasing demand for assisted housing. This pattern can be avoided if all the players work together and innovate -- government has an important role in this. "That is why we are urging the federal government to adopt approaches that will benefit all Canadians -- those who need assistance, and the vast majority of Canadians who aspire to market-based housing that they can afford. With the federal government investing significantly in social housing, infrastructure and transit, and the other policy measures at its disposal, there is a huge opportunity to 'get it right' when it comes to housing for all Canadians," says Lee. Indeed, Let's Talk Housing is more than just a hashtag. It's only the beginning of meaningful, ongoing discussion.